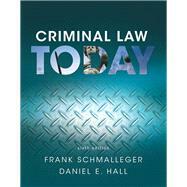 by Schmalleger, Frank; Hall, Daniel E.
Bringing criminal law to life. Criminal Law Today, 6/e, brings criminal law to life by relating it to real stories from today’s headlines. The text’s approach is strongly influenced by the belief that the law has always been, and remains, a vital policy-making tool. As a topic for study and discussion, the nature and life of the law is more important today than ever before. The text highlights the challenges that face the law as it continues to adapt to the needs of a complex and rapidly changing society and features a balanced text/casebook approach that provides a lively introduction to criminal law. Effective in-text learning tools give students the resources they need to master the material presented in the text. To give your students the most accurate picture of criminal law today, the material on law and crime is updatedthroughout the Sixth Edition. New cases and stories drawn from recent real-life events are included to draw readers into the material and help them contextualize how theory translates into practice. Criminal Law Today, 6/e, is also available via REVEL™, an interactive learning environment that enables students to read, practice, and study in one continuous experience. Learn more. Frank Schmalleger, Ph.D., is Distinguished Professor Emeritus at the University of North Carolina at Pembroke. He chaired the university’s department of sociology, social work, and criminal justice for almost 20 years – while specializing in research in crime and delinquency. He has taught dozens of courses at both the graduate and undergraduate level in both on-ground and on-line environments. Schmalleger is the author of many books and journal articles, including the standard-setting Criminal Justice Today, 14/e (Pearson); Criminal Justice: A Brief Introduction, 12/e (Pearson); Criminology Today, 8/e (Pearson); Criminology, 3/e (Pearson); Criminal Law Today, 6/e (Pearson); Corrections in the Twenty-First Century, 6/e (McGraw-Hill; with John Smykla); Courts and Criminal Justice in America (Pearson; with Larry Siegel and John Worrall); Juvenile Delinquency, 10/e (Pearson; with Clem Bartollas); and Policing, 2/e (Pearson; with John Worrall). Schmalleger has worked with U.S. military personnel -- primarily members of the Army’s CID, MP’s, Air Force SP’s and members of Air Force OSI from the late 1970s to the early 1990s helping officers make successful transition to civilian life. Schmalleger’s philosophy of both teaching and writing can be summed up in these words: “In order to communicate knowledge we must first catch, then hold, a person’s interest—be it student, colleague, or policymaker. Our writing, our speaking, and our teaching must be relevant to the problems facing people today, and they must in some way help solve those problems. Daniel E. Hall, J.D., Ed.D. earned his B.S. at Indiana University, Juris Doctor at Washburn University, and Doctor of Education in higher education curriculum and instruction at University of Central Florida. He is a graduate of Harvard University’s Institute for Educational Management. He practiced law both in the United States and the Federated States of Micronesia. He has been on the faculties of the Department of Criminal Justice and Legal Studies at University of Central Florida, Department of Criminal Justice at The University of Toledo, and the Department of Justice and Community Studies at Miami University, where he is presently professor and department chair. Dr. Hall is also visiting professor of law at Sun Yat-sen University in the People’s Republic of China. He is the author of over 20 public law textbooks, including revisions, and a dozen law and social science articles on justice subjects. You can learn more about Daniel at www.danielhall.org and he may be contacted at hallslawbooks@gmail.com.